Oz en Oisans is a small purpose-built resort, sitting 1350m above the traditional village of Oz and linked to the Alpe d'Huez skiing area. Although it's modern, it was developed in a very traditional style with chalets clustered under pretty fir trees. 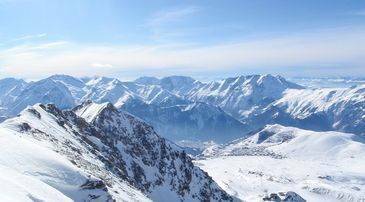 The local skiing is good, particularly for families, with plenty of pistes for beginners and intermediates, and the wider ski area around Alpe d'Huez offers high quality skiing on a variety of terrains with good snow conditions. 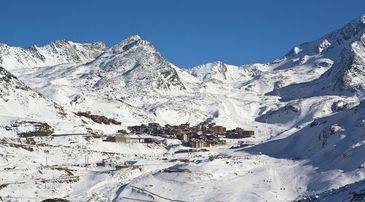 Oz is more manageable and affordable base from which to explore the vast Alpe d'Huez ski area. Although it's quite low, Oz en Oisans has a long season and a very good snow record, with an average annual snowfall of over 3 metres. A good snowmaking programme, with 660 canons, helps keep things in top condition. From the village of Oz en Oisans, the ski area of Oz/Vaujany is easily reached, lying within the larger Alpe d'Huez ski area. The local area itself has a total of 75km of pistes, with a 1700m vertical reach to a height of 2800m. Around a quarter of the marked runs are for beginners, 37% for intermediates, 30% for advanced skiers, and 10% for experts. Beginners should use the Poutran lift to get to the nearest green slopes. There are good reds around Oz too, and excellent blue runs at Montfrais, at Vaujany. Snowboarders love the area for its variety of slopes and a very good terrain park at Montfrais. There are two cross-country trails, the 10km Poutran Loup, and the 20km Lakes Loup. Access to Alpe d'Huez opens up one of the great Alpine ski areas, where you'll find the longest black run in the world and the greatest vertical in the skiing world. It's easily accessible by cable car from Oz en Oisans. The whole ski area has 80 lifts accessing 250km of pistes divided into 135 pistes. There are 42 greens, 37 blues, 39 reds and 17 black runs. An army of 918 canons help keep the snow in good order, but with a lot of high altitude slopes, Alpe d'Huez is generally snow sure. That famous vertical drop, will take you all the way back to Oz if you have a spare hour-and-a-half, and good skiing skills. Start at the summit of Pic Blanc at 3,330m, enjoying a view that's said to take in a fifth of France, before shooting down through black, red, blue and back onto the black La Fare piste into L'Enversin d'Oz at 1,125m. It's not all record breaking plunges though, Alpe d'Huez is a great complement to Oz with a wide variety of pistes that all skiers can enjoy. 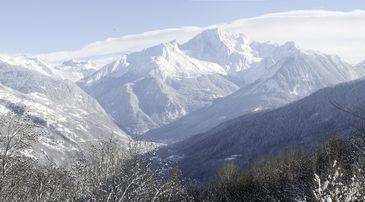 Alpe d'Huez's beginners' slopes are also very highly rated, and there are 20 greens close to the village. Signal has long, cruising red and blue runs. No one should be bored in Oz en Oisans, and because the place is small and traffic free, it's quick and safe to wander around and find your family fun. There is a sports and wellness centre, Villages Clubs du Soleil, with swimming, plenty of spa facilities and some classes. You can skate and toboggan in the village and there's an indoor climbing wall. The resort also puts on a programme of winter events for kids, including an alternative sliding selection of ways of getting around on snow and ice. The more established resort of Alpe d'Huez also has a range of in-resort diversions. Small is beautiful at Oz en Oisans, and the French feel of the place is reflected in good regional cuisine at a number of restaurants in the resort and on the slopes. There's fast and international food too, and it's possible to eat at good-value prices in and around Oz. At Alpette, P'Oz Chez Passoud, mixes brasserie and snack-bar fare and has one of the best views in the district. The Auberge de L'Alpette has more traditional food and a very family-friendly approach to service. On the Combe du Poutran, pull over for Le Perce Niege and enjoy their terrace and good local dishes. In the town, Restaurant La Parisienne serves simple, down-to-earth and very good filling food. Ski-in restaurant La Ferme d'Oz is done up in Alpine style and reflects that in a largely local menu. Ello Restaurant does pizzas and crepes, as does Le Poutran, which also does takeaways to enjoy in your chalet. The town has a particularly good set of traditional French village shops for local specialities, and the Sherpa supermarket does hot takeaway food. Most people will spend some time at the Ozzie Bar, in one of the accommodation blocks to the west of the main village centre. It opens from 4pm when skiers start to come off the mountain and the last revellers will leave in the early hours. It serves good coffee as well as beers and decent cocktails and has a pretty terrace. La Causerie offers a mix of snack food and takeaways for all ages as well as a welcoming bar with a sunny terrace. Oz en Oisans has a long season, running towards the end of April. Opening of the slopes is progressive as conditions allow. In 2015-16, the opening dates were: first opening 5th December, full opening on 19th December to 23rd April 2016. Lifts are generally open from 8.30am to 5pm. 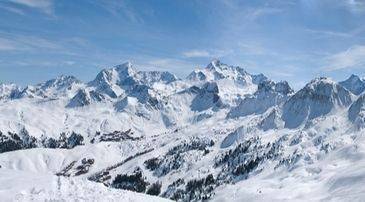 Oz en Oisans has a wide variety of lift passes with age and group discounts. Passes are available for the Oz-Vaujany area or the Grand Domain of Alpe d'Huez. Adults are 13  64-years-old, children's rates are for 5  12-year-olds, and seniors are from 65  71-years-old. You can buy for a few hours or by the day up to seven days. There are six winter sports shops in Oz itself. La Cabane à Skis is the largest, next to the ski school, and offers rental and sale. Book in advance along with your Madame Vacances accommodation booking to get a 30% discount. There are four ski schools in Oz en Oisans, including, ESF, the largest French ski school, which offers a ski kindergarten for children aged 3 to 5 years. The resort has a range of tuition, from individual lessons to group classes, children's and beginners' sessions and ski guiding and ski touring for experts. The day care centre has places for 20 children from six months to six years of age. They have fully qualified staff and offer a range of early learning activities and, in conjunction with ESF, early ski lessons for three year olds and up. You can book for half-days or full days, up to six days. The centre is open 9am to 5pm and you can book in advance. There are eight outdoor free carparks in Oz. There is covered parking for a fee next to the ice rink. Many of the village's chalets and apartment blocks come with parking.